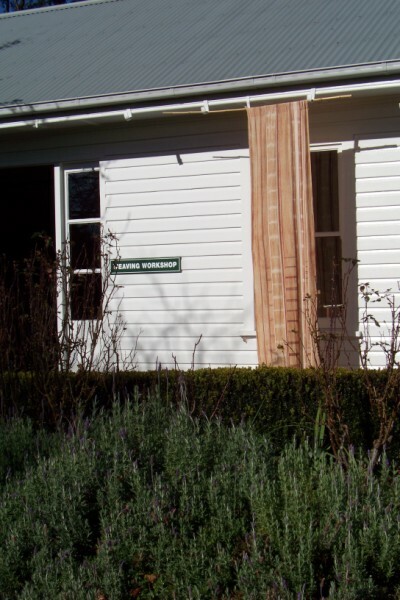 This post mid month is to celebrate- weavers, as well as celebrating the results of the week long course at Sturt’s Winter School. 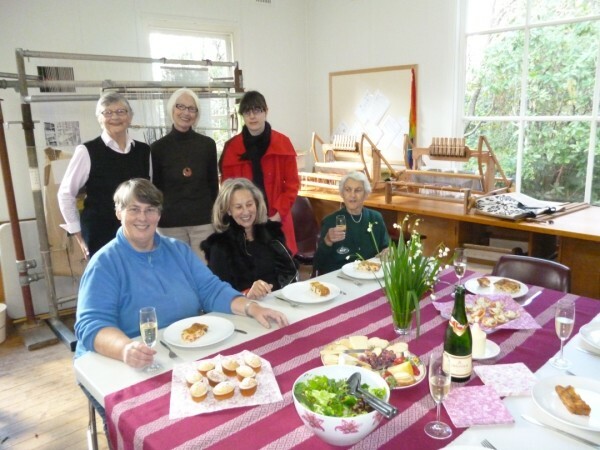 There were seven in the class with four who had never touched a loom before, one who had attended the last Summer School, one who had returned to weaving and one who had more experience. The amount of work produced was amazing. There were a collection of samples exploring various ways of using recycled materials as well as a final project. I will let the images tell the story, but I will say that I am in awe of these ladies. 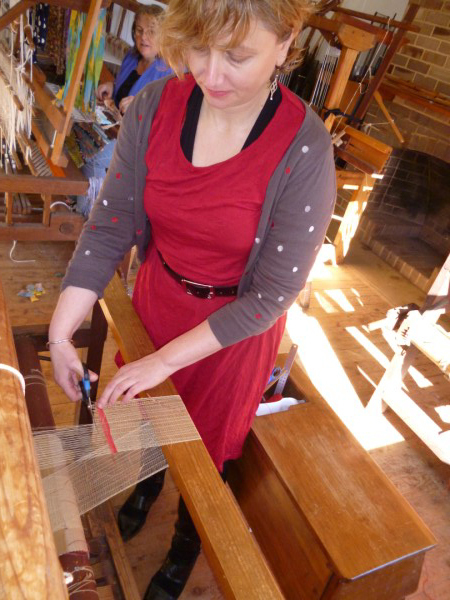 This is surely a celebration of hand weaving. 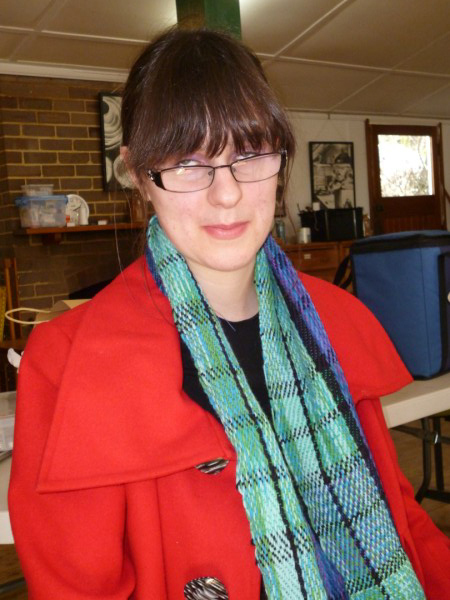 Officially my Artist Residency at Sturt has finished. It has been a wonderful experience. I came with thoughts of what specifically I wanted to research. Life and circumstances has meant that I didn’t get all that I wanted to achieve, achieved. But I am delighted with what I have done. 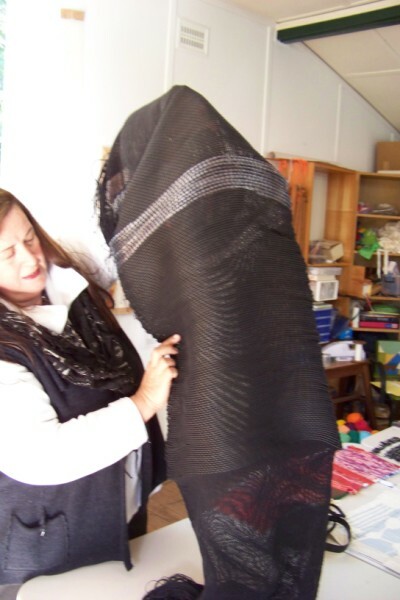 As a result of my exhibition, I have had all manner of interesting people come and discuss their ethnic textiles with me. 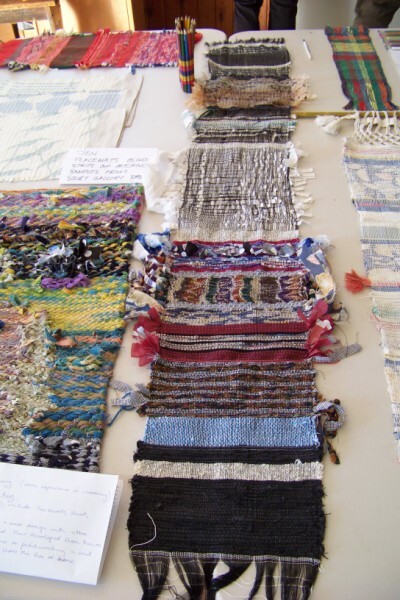 As a result I have spent considerable time researching and analysing those textiles. I have managed to recreate many of them. The following is one example. 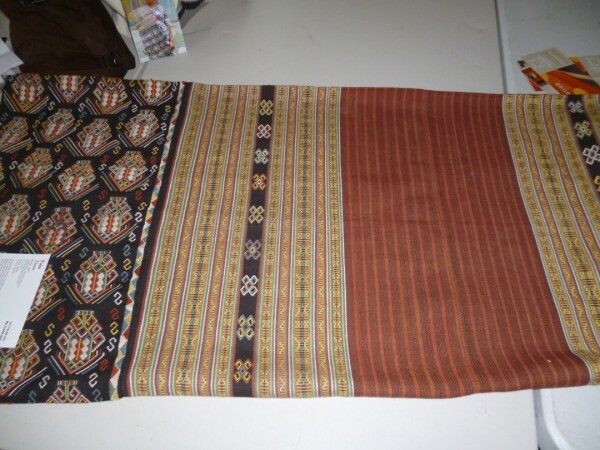 This textile is from West Timor and was brought by Lynn, one of the Saturday girls. She had acquired in Threads of Life in Bali. This textile combines many interesting elements. 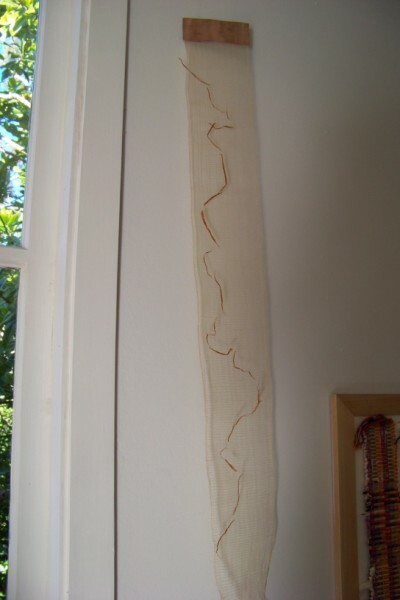 It is woven in 3 panels. 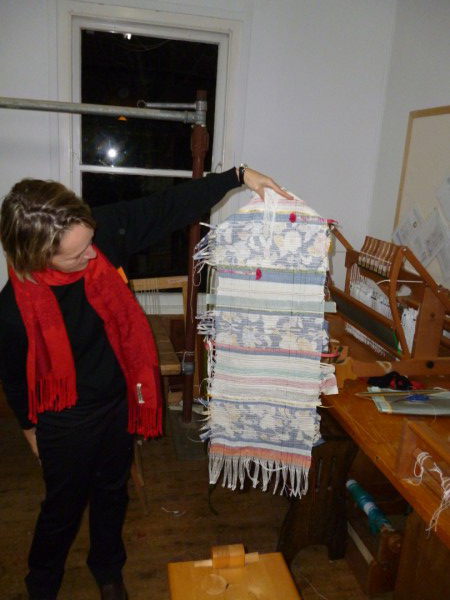 It has a large buna (warp wrapping) panel and 2 other panels with elements of warp manipulation and colour stripes. The warp patterning has some elements of sotis but not the complex elements that I have previously explored. 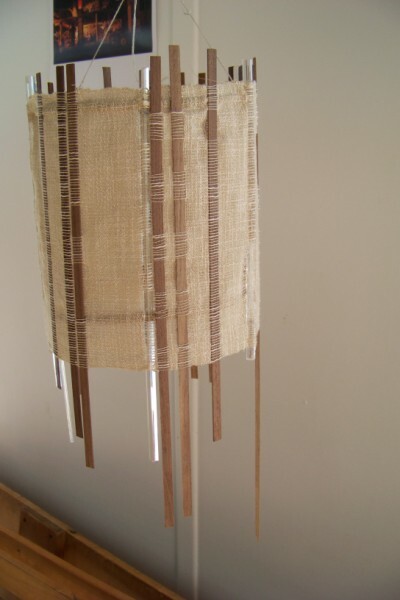 I wanted to explore the colour effects in the stripes, the warp manipulation and this form of warp wrapping. 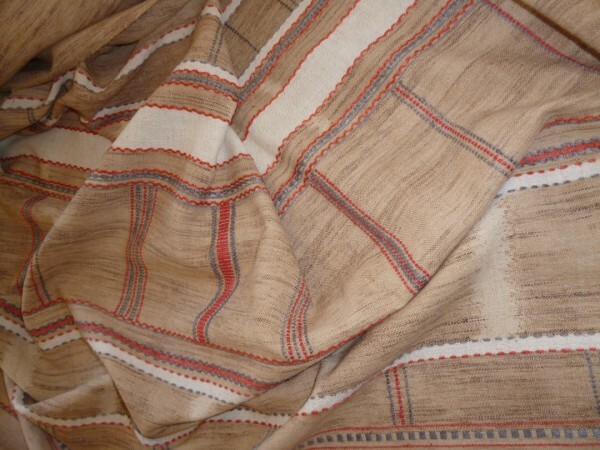 I have managed to recreate this textile in much of its original detail: the motifs found in the warp manipulation stripe and the colour effects in the stripes. I have recreated the style of buna but have used a simple element from the original. I must admit I am very pleased with the end result. 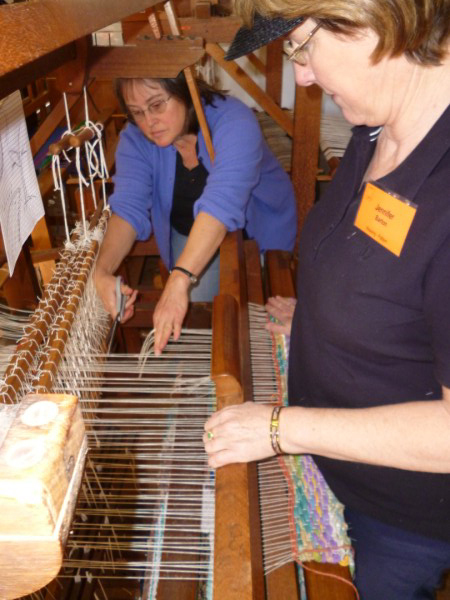 It was a very fitting last warp from the loom. The other long term project that I have been recording is the persimmon dyeing. I have put together the 3 dyed warps. 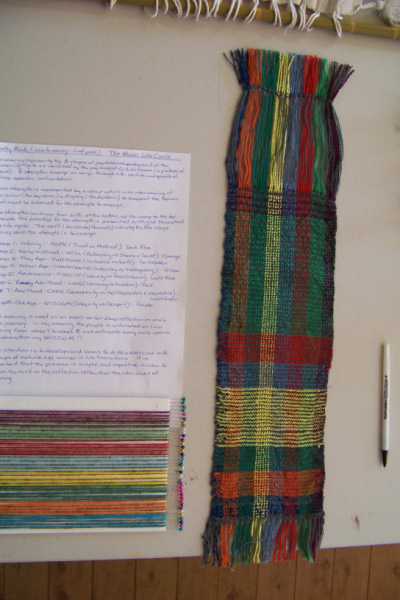 In an attempt to keep track of where the warps start and finish I have delineated them by coloured stripes in silk. These are in the main supplementary warps. 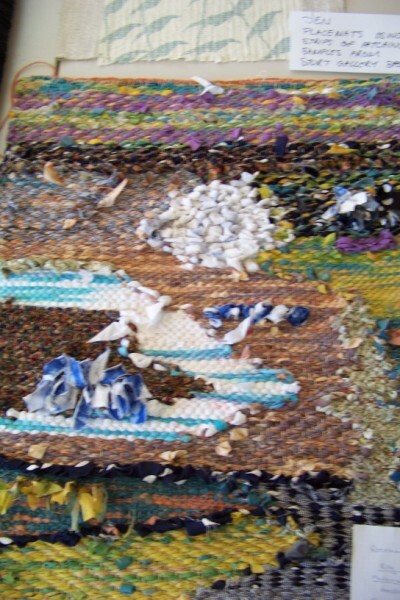 I have also added in some natural coloured cotton and while weaving added some inlay of the coloured silk to make a more interesting textile. 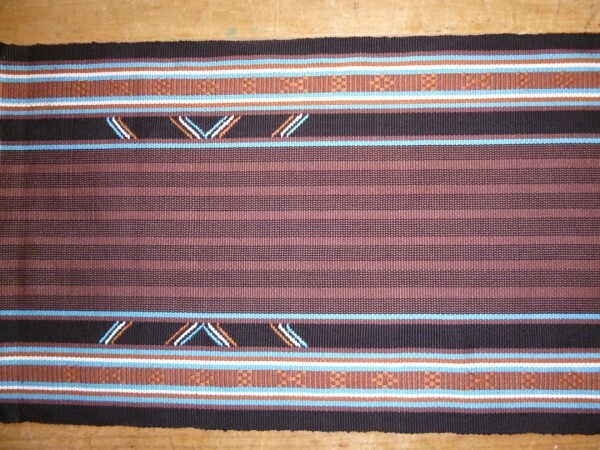 It is intended to be a tunic top and I have woven it with placement of elements in mind. 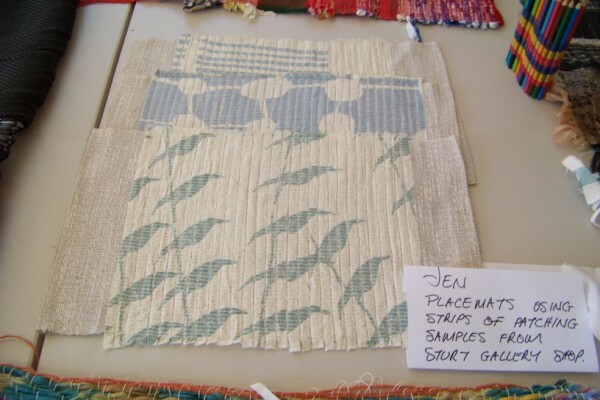 Once woven, I continued the wetting and exposure to sunlight process for a week. 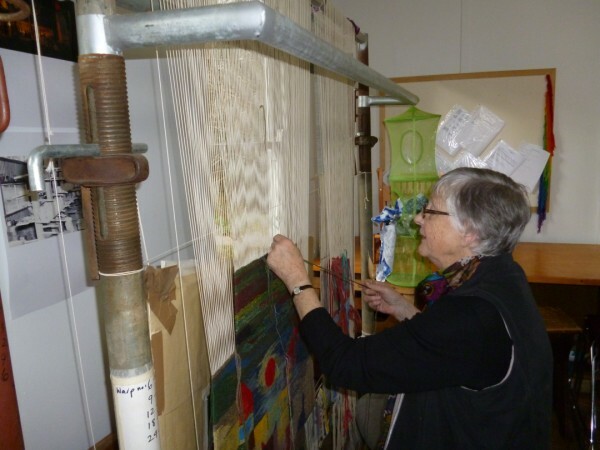 It continued to get progressively darker and some of the unevenness of the warp dyeing dissipated as all warp threads were now exposed to the sun. It was becoming a lovely pink/brown colour. It started to rain. I thought that this would be an appropriate time to finish the cloth properly. Intentionally, I washed it in hot water to remove the gummy persimmon. Then because I have no real drying facilities and it was raining I put it in the dryer. Interestingly the pink brown has now become a straight brown. Persimmon dye is obviously heat sensitive too. Am I disappointed about the change of colour? No. It is just part of the experimentation process. The cloth does have a lovely handle now that the juice has been removed. I wonder if it will still get darker. Students continued to work very hard. Some more warps have been finished; some are still on the loom. To mark the end of the Tuesday term, we had a party. Notice the lovely cloth from Vietnam that Maureen brought. Yes, I analysed that one too and recreated it. 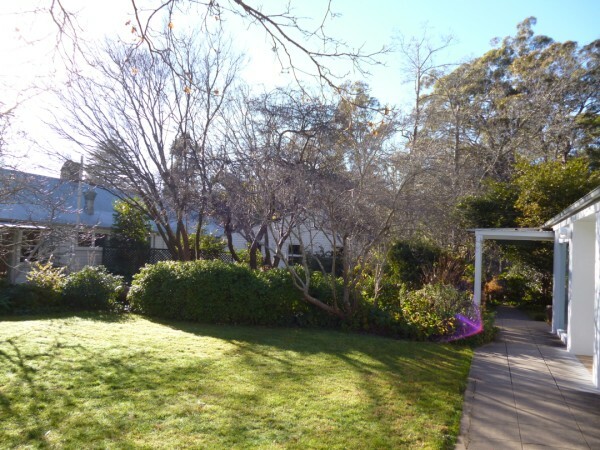 Finally, the garden: at the start of the residency I took a photo of this approach to the weaving studio. Time passes. Winter is here! PS I still have a week to go here at Sturt. I am now involved in teaching at the Winter School where we will be exploring the use of recycled materials…amongst other things. You are currently browsing the Kay Faulkner's Blog blog archives for July, 2012.